Chiropractic care is a non-surgical treatment for herniated discs. But what is a chiropractor's approach to treating a herniated disc? First let's get a quick review of what a herniated disc actually is. There is an intervertebral disc between each vertebra of the spine. Discs act as a shock absorber and a shock distributor. Imagine if you jump up and down. What would happen to the stack of bony vertebrae that make up the spine without the cushioning and support of these discs? Now, move your back from side to side. Again, you can visualize the give and take of the discs between the vertebrae. Without these discs, your spine couldn't function. Intervertebral discs don't really "slip"—although the phrase "slipped disc" has come into popular usage to refer to bulging, ruptured, or herniated discs. Throughout this article, we'll refer to herniated discs, which is the more correct term. Your discs are made up of the annulus fibrosus (the tough outer layer) and the nucleus pulposus (which contains a soft, gelatin-like center). When cracks occur in the outer layer of the disc, the material inside of the disc can begin to push out. Numerous factors can cause a disc to herniate. For example, there may be too much stress on the disc due to poor posture or from being overweight. In fact, a herniated disc can be caused by a combination of factors. Can Sneezing Cause a Herniated Disc? For many people with back pain caused by a back pain condition (ie, herniated disc), the problem starts off small and then gradually builds until you start to feel symptoms, such as back pain. For example, let's say you sneeze and feel a sudden, sharp pain in your back. Then that pain progresses into leg pain. You may have had an underlying herniated disc, and the sneeze was what triggered it to progress. So, yes: a sneeze (or a cough) can herniate an intervertebral disc. 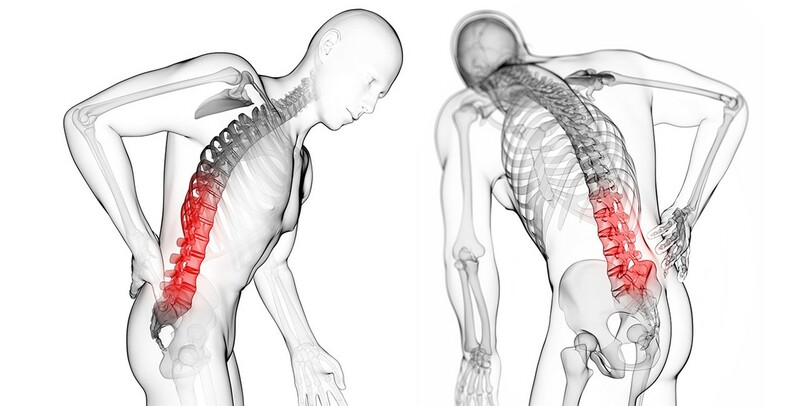 A chiropractor can help address back pain and other herniated disc symptoms. At your initial appointment, your chiropractor will go through your medical history, do a physical exam, and perform orthopaedic and neurological tests. Your chiropractor will look for several things. These are important questions the orthopaedic and neurological exams can help your chiropractor answer. The chiropractor will also carefully look at your posture, and he or she may order an x-ray or MRI, if necessary, to help with the diagnostic process. Chiropractors evaluate the entire spine. Even if you only have lower back pain, your chiropractor will examine your neck, too, for example. He or she wants to see how well your spine is functioning overall. Remember, what happens in one area of your spine can influence other parts of your spine and/or body. After reviewing this information, your chiropractor can determine if you have an intervertebral disc injury. The type of disc injury you have will determine what treatments your chiropractor will use to address your symptoms. Some patients are not good candidates for some types of chiropractic care treatments. For example, if you have cauda equina syndrome (a condition in which you lose control of your bowel/bladder with an accompanying intervertebral disc injury), then you will need immediate medical care as this is something that cannot be treated by your chiropractor. In addition, if your chiropractor finds that you have advanced loss of strength, sensation, reflexes, and other unusual neurological findings, then he or she will refer you to a spine surgeon. However, most intervertebral disc injuries are related to a herniated disc, and your chiropractor can provide you with various treatment options to address your pain and other symptoms. To treat a herniated disc, your chiropractor will develop a treatment plan that may include spinal manipulation and other chiropractic techniques to help ease your herniated disc symptoms. This will be an individualized treatment plan, but it may include manual therapy and therapeutic exercises. The specifics of what are in your treatment plan are particular to your pain, level of activity, overall health, and what your chiropractor thinks is best. As with any treatment option, don't hesitate to ask questions about what chiropractic treatments are being recommended and why. You want to make sure you understand what will be done and how it can help relieve your pain. A common chiropractic technique is the flexion-distraction technique, which can be used to help address herniated disc symptoms. Flexion-distraction involves the use of a specialized table that gently "distracts" or stretches the spine. This allows the chiropractor to isolate the affected area while slightly "flexing" the spine using a pumping rhythm. There is usually no pain associated with this treatment. Instead, the flexion-distraction technique's gentle pumping to the painful area allows the center of the intervertebral disc (called the nucleus pulposus) to assume its central position in the disc. Flexion-distraction may also improve disc height. With flexion-distraction, you generally need a series of treatments combined with adjunctive physiotherapy, supplementation, and at-home treatments (your chiropractor will let you know what those are). Gradually, specific exercises to treat your herniated disc will be incorporated into your treatment plan. Chiropractors also use pelvic blocking techniques to treat herniated disc symptoms. Pelvic blocking treatments include using cushioned wedges, which are placed under each side of the pelvis. Gentle exercises may also be used. These will allow changes in mechanics to draw your disc away from the nerve it may be pressing on. It's a misconception that chiropractors "pop a disc back in place" using forceful adjustments. Another misconception is that chiropractic care involves a few quick treatments, which can "fix" your disc. Instead, as explained above, chiropractors treat herniated discs using gentle low-force techniques. Your chiropractor will develop a treatment plan for your herniated disc, and if your symptoms do not improve with chiropractic care techniques, your chiropractor may recommend a consultation with a spine surgeon. Source: Haldeman S. Principles and Practice of Chiropractic. York, PA: McGraw-Hill; 2005.